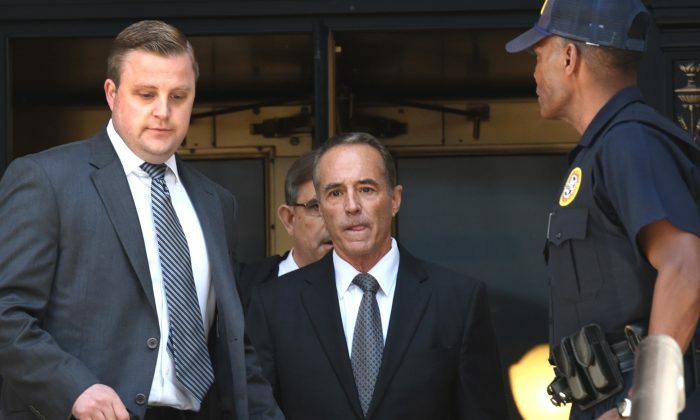 Chris Collins, a Republican for New York’s 27th Congressional District, was indicted on insider trading charges involving an Australian biotechnology company for which he serves as a board member, federal prosecutors announced on Aug. 8. The indictment also named two others: the congressman’s son, Cameron Collins, and the father of his fiance, Stephen Zarsky. Prosecutors accused the congressman of passing sensitive drug-test results from the company, Innate Immunotherapeutics, to his son in June 2017, so that he could trade on Innate’s stock. The congressman’s son also allegedly passed on the inside information to Zarsky, who then traded on it and tipped off others. “These charges are a reminder that this is a land of laws and that everyone stands before the bar of justice,” Geoffrey Berman, an attorney for the U.S. Southern District of New York, said during a press conference. The indictment charges all three defendants with multiple counts of securities fraud, wire fraud, and other crimes. Each of them will also face civil charges by the U.S. Securities and Exchange Commission. Aside from being a member of the board of directors, which gave him access to the nonpublic material, Collins was also Innate’s largest stockholder, holding approximately 16.8 percent of its stock. “Collins, the defendant, violated the duties he owed to Innate by passing material; nonpublic information regarding the Drug Trial results to his son,” the indictment stated. Two attorneys representing the congressman maintained Collins’s innocence and said he would have “more to say” later in the day. Prosecutors said the trading took place before the public release of drug trial data that would have negatively impacted the defendants. “All of the trades preceded the public release of the negative Drug Trial results, and were timed to avoid losses that they would have suffered once that news came public,” the indictment stated. On Aug. 8. House Speaker Paul Ryan removed Collins from the House Energy and Commerce Committee until the allegations were settled. Collins has served in New York’s congressional district since 2013.